Even just looking at some wind parks can give cause for skepticism: Individual turbines are often at a standstill. This impression doesn't line up with the notion that wind energy must be used intensively in order to meet the needs of the energy transformation. It is against this background that scientists have been increasingly questioning in recent years whether the anticipated contribution of wind energy to the energy mix may perhaps be over-estimated. Sonja Germer and Axel Kleidon, who conduct research at the Max Planck Institute for Biogeochemistry in Jena, have determined that wind turbines in Germany supply about 73 percent of the theoretically attainable energy. "Based on our studies, the turbines largely make effective use of the wind and thus contribute to the success of the energy transformation," says Axel Kleidon. In 2014, the share of wind energy in electricity generation was 9.1 percent. The influence of reduced wind speeds is not yet noticeable. In earlier studies, the scientists calculated that as more turbines are installed in an area, the efficiency of wind turbines would drop. Given such intensive use, the wind speeds should drop, because every turbine removes part of the wind's energy. "We expected that we should already be able to find such a trend in some regions of Germany," says Axel Kleidon, group leader at the Max Planck Institute for Biogeochemistry in Jena. That is why, for their new study, the researchers examined the years 2000 to 2014 as it was a period during which the number of wind turbines in Germany increased from almost 9,000 to more than 25,000. Since the turbines during the same period clearly improved in capacity – for example, the rotor diameter on average increased from 42 to 66 meter – the average capacity increased from 611 to 1453 kilowatt. The installed capacity increased from 5.7 gigawatt to 37.6 gigawatt. "The difference between the expected and the actual power yield has remained relatively constant over the years," says Sonja Germer, scientific researcher in the task group. The researchers did not find any drop in efficiency linked to the increased number of turbines. "We probably don't use enough wind energy yet to be able to see the influence of reduced wind speeds clearly enough," says Sonja Germer. 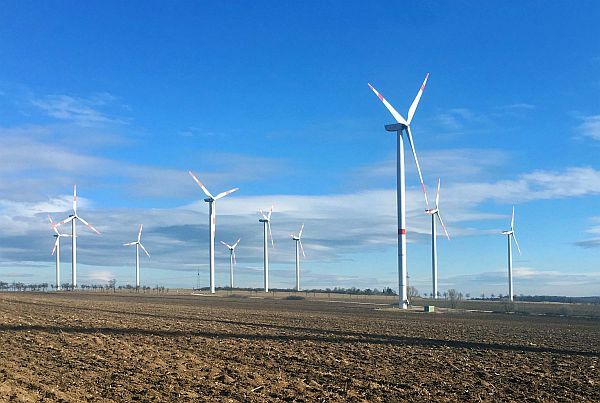 Sonja Germer and Axel Kleidon (2019) Have wind turbines in Germany generated electricity as would be expected from the prevailing wind conditions in 2000-2014? PLOS ONE.